√ Featured in "Get in Shape"
The "7 Minute Workout" is a research-backed workout program that is simple but effective. It is published in the leading research journal ACSM(American College of Sports Medicine). Now, let's rise to the challenge! 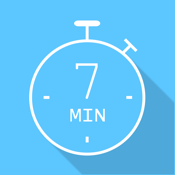 “7 Minute Workout Pro” is the perfect app to help you doing the 7 minute workout! • "Good job! - This app is perfect for beginners and those that want to work up a sweat but have little or no time to workout." by Ezrocks!